University of Maryland, Baltimore County shares in a unique American college phenomenon of open or green spaces. Campus open spaces—places set aside for students, faculty and staff to gather informally or formally—help to shape a sense of community for universities across the country. These areas are a unique part of American college culture, something that cannot be seen in the tight and rigorous design of European universities which often have academic buildings spanning for blocks on end with few open spaces in sight. 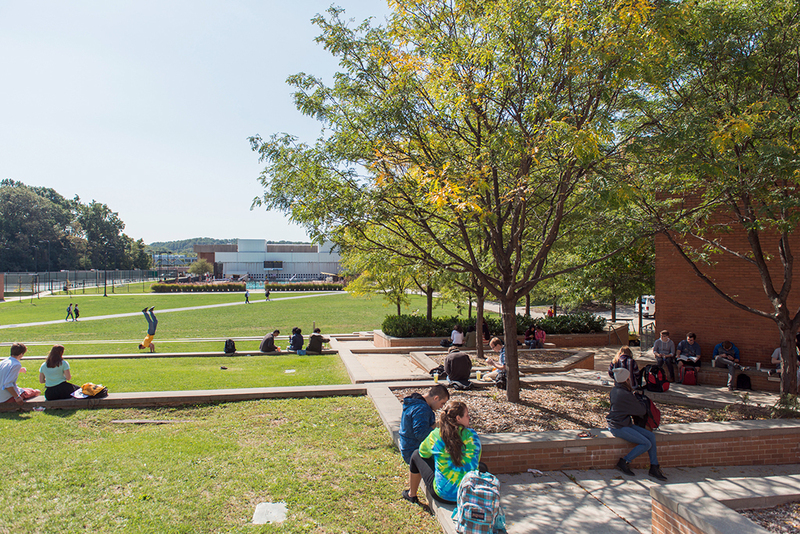 UMBC’s most important public greenspace, the Quad, is bordered by Academic Row, the Commons, and the Retriever Athletic Center. The Quad provides the campus with a space for campus related or recreational activities, relaxation, and even class space in good weather. Having been used over the years for student protest, social celebrations, and more, the Quad has been a place where students can congregate outside of the academic buildings and structures on campus. 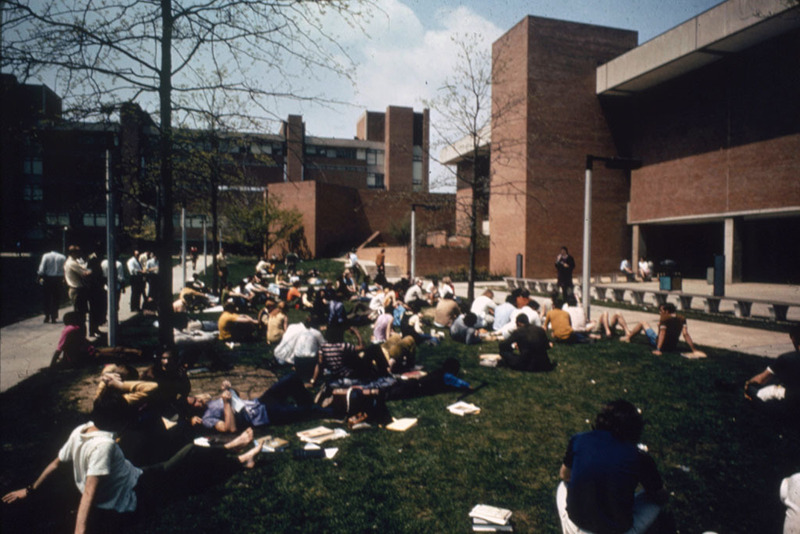 Throughout UMBC’s history, students have often used the Quad as a gathering place for celebrations. 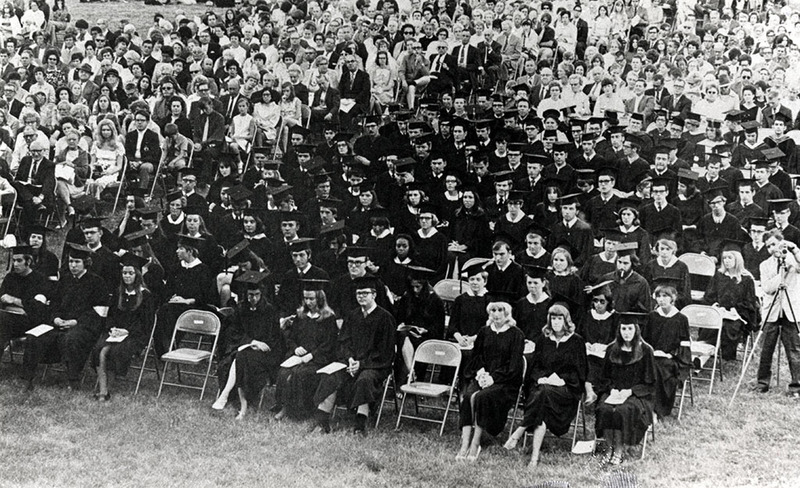 UMBC held the first graduation commencement on the in 1970. Involvement Fest, a day which gives students a chance to meet and learn about the various student clubs and organizations at UMBC, is held on the Quad every year. 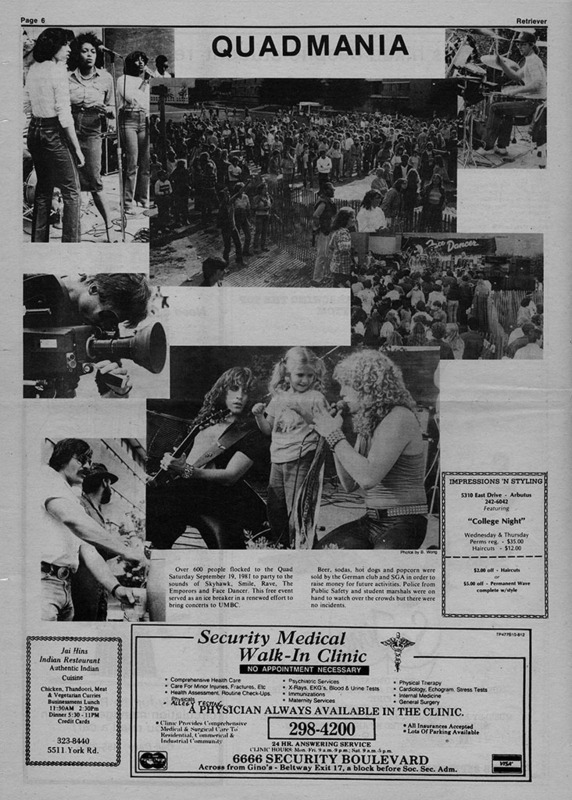 Most notably, Quadmania, an annual event in the spring featuring musical concerts, food, and other activities was first held on the Quad on September 19, 1981. The event was, and still is, intended to celebrate the campus, the coming of spring, and the nearing end of the school year. The Quad is not only used for celebrations—it has also served as a meeting space for students to express their concerns or rally together in opposition to various proposals or events. In the late 1970s, students gathered on the Quad to express their disapproval of the Maryland Higher Education Commission proposing to merge UMBC with University of Maryland, College Park. The rally, organized by the Student Government Association (SGA) and other student organizations, included more than 1,000 students and was the largest in UMBC history at the time. The Quad is just one of several open spaces on campus. Others include the library pond and Erickson Field, east of the Albin O. Kuhn Library and Gallery. Open and green spaces across the UMBC campus, provide the university with a unique way for students to come together as a community. Students can, as they have in the past, use these spaces as they see fit—for gathering, learning, rallying, or relaxing. 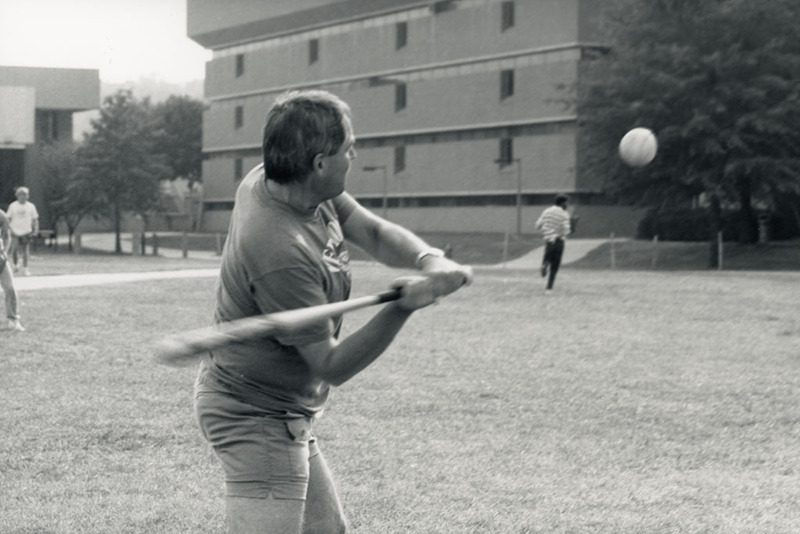 Stephanie Smith and Sarah Huston, “The Quad at UMBC,” Explore Baltimore Heritage, accessed April 19, 2019, https://explore.baltimoreheritage.org/items/show/547.